About "Future Israel (#03 in New American Commentary Studies In Bible And Theology Series)"
Customer Reviews For "Future Israel (#03 in New American Commentary Studies In Bible And Theology Series)"
Barry Horner's "Future Israel" is one of the finest works I have ever read and could easily be labelled the definitive study on literal Israel and its future (a statement echoed by John MacArthur). 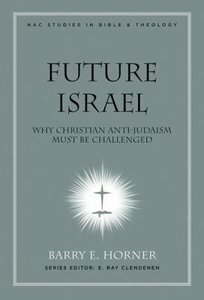 Horner has exhaustively studied the Scriptures and Church History to disprove the notion of an allegorical Israel (as is the position of many denominations, in which physical Israel is no longer the concern of God and that "Israel" is now representative of the Church). He is neither careless or emotional in his thesis, for he clearly shows how a future restoration of Israel was not only stated in Scripture but now many throughout Church history attested to this (notably men like Spurgeon, Bonar, Ryle, etc. which is particularly interesting as they are all Reformed in their teachings). The theological and historical positions in this book address all questions directed towards the issue of Israel by many today and easily refutes those who claim Israel is no longer "the apple of God's eye". This work, while academic, is still accessible to the average reader and should be read slowly and carefully with Scriptures in hand. This is a book one will come back to over the years and the book to be given to anyone who truly wants to understand this topic once and for all, free from political or traditional influence. Highly recommended.